To me, the image speaks of a journey. 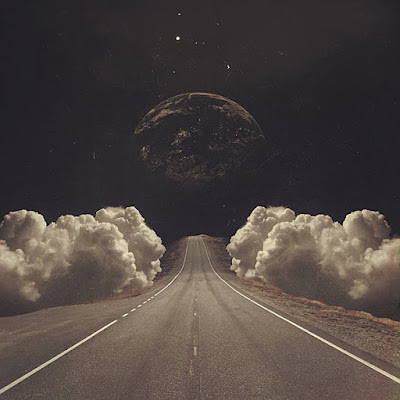 I could've interpreted it any number of ways, but as I'm in an electro mood at present, I decided to go with an 80's-inspired synthesizer piece, creating literal references to visual cues along the way: travel, clouds, the awe-inspiring image of the moon, the twinkling of stars. Instruments called upon for this project, recorded in an evening, mixed in another, were Novation K-Station, Korg MS-20 Mini, Tal U-No-LX, Orchestra Silver, a few staple drum machine samples, and a field recording. I don't expect to win the competition with this by any means. But as an exercise in creating music based on an image, it was a lot of fun.When time allows I intend to work it into a full-length track. I'm a writer, nature photographer, and composer of electronic music. I compose music 'on-spec' for Brokensea Audio Productions, release the occasional synthpop album as 'The Manitou,' and generally tinker with sound design and studio gadgetry. When time allows, I hope to produce a full-cast audio drama of my all-ages novel: 'Tales of Elves and Trolls: The Crystal Goblin.' In the meantime, I continue to write the sequels and bring you posts on audio geekery. (c) 2011 Joshua M. Blanc. Awesome Inc. theme. Theme images by moorsky. Powered by Blogger.